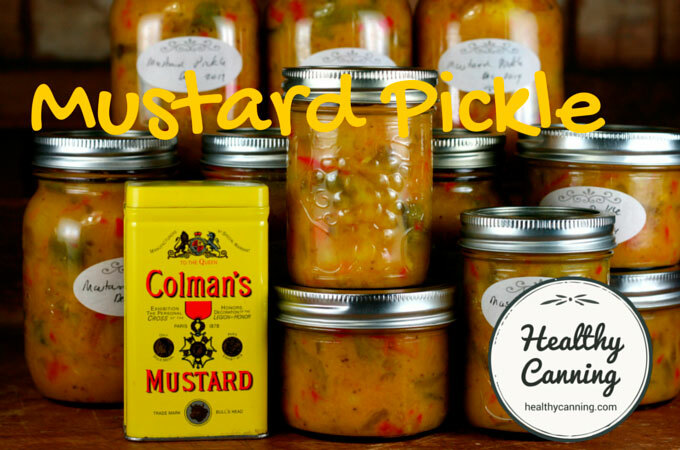 Mustard Pickle is a tangy rich condiment that has been prized for generations at the side of a plate to liven up the plainest of foods. It consists of crispy chunks of vegetable in a sweet and tart tangy sauce made of vinegar, mustard powder, flour and coloured with turmeric. 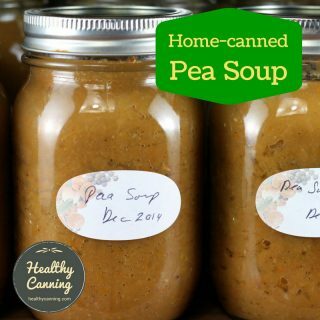 This recipe makes a lot; you may want to cut it in half. 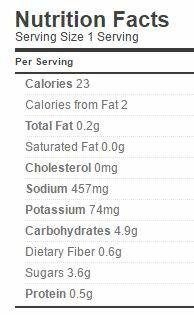 NOTE: If you need or want to avoid flour, consider Sweet Mustard Pickle (flour-less and tomato-less). 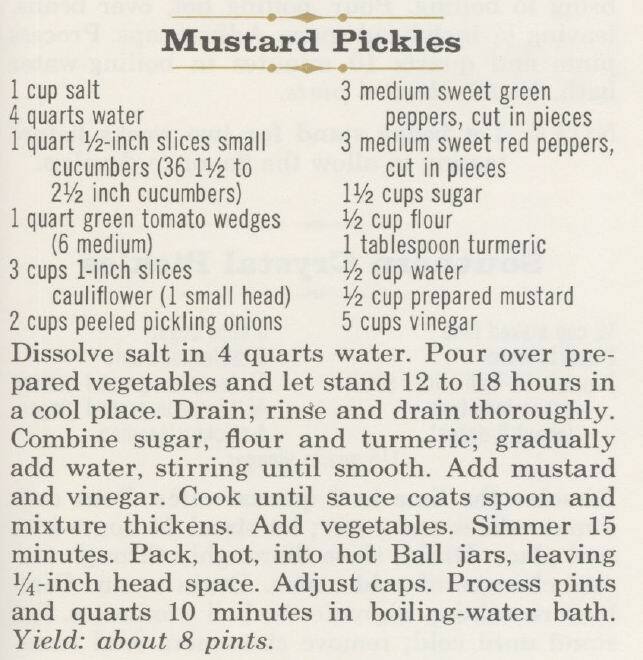 There’s also a mustard pickle recipe in the Ball / Bernardin Complete Book (2015 edition, page 304) which uses Clearjel instead (no tomato and no cauliflower.) Just verify (as usual) with your source of Clearjel that there has been no cross-contamination with wheat flour gluten during production. 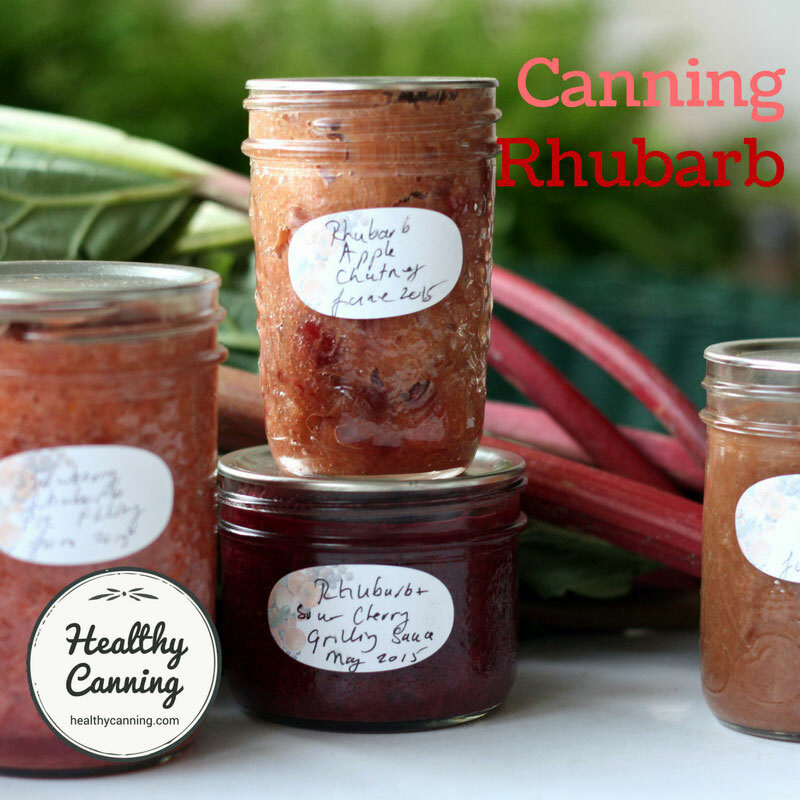 Jars: Quarter-litre (1/2 US pint / 250 ml / 8 oz) OR half-litre (1 US pint / 500 ml/ 16 oz) OR litre (1 quart / 32 oz) jars. The prep work will take a while. It comes together fast after that. Prep the veg from the cucumber down to the onions. 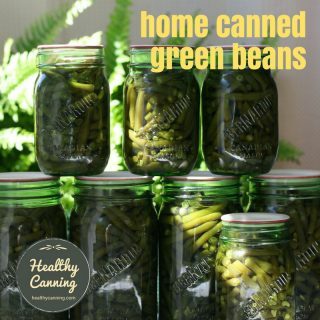 Put in a large bowl or pot, that you will have room for in fridge, several if needed. Mix vegetables well with the salt. Put vegetables in fridge for 12 hours. Stir or toss occasionally if desired. Mix everything from the turmeric down to the flour in a large pot. Whisk in the vinegar 250 ml (1 cup) at a time, then add the water, sugar and the garlic. 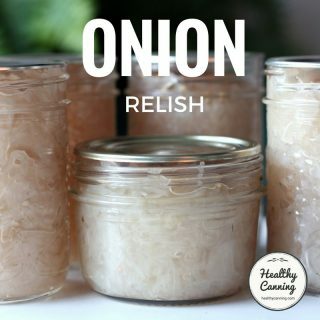 Bring to a boil while stirring frequently, then reduce to a simmer until it's thick enough to start coating a spoon -- about 5 minutes. Whisk or stir frequently to avoid burning at the bottom. Add the drained veg to the mustard sauce in the pot, and simmer for 20 minutes counting from the time you added the veg to the sauce. 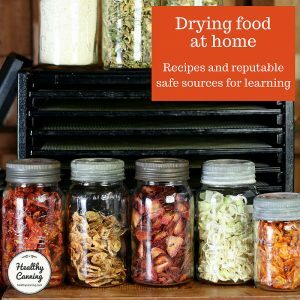 Process all jar sizes for 10 minutes; increase time as needed for your altitude. Yes, it is fine to use flour in this recipe. 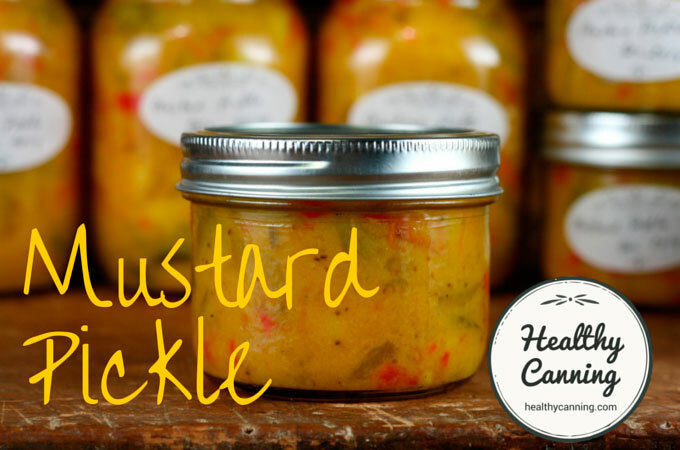 Some people have older relatives with dentures, etc, who prefer a softer bite on their mustard pickle. If you are trying to please them, after the vegetables have brined skip draining and rinsing them. Instead bring them just to a boil in a pot (using the brine water is fine, add more water if needed), then simmer lightly for 3 to 5 minutes, then drain well and proceed at step 6 above. Instead of the salt, you can use a non-bitter, non-clouding salt sub. We have found Herbamare Sodium-Free to meet those requirements. 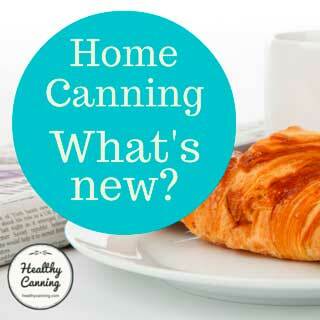 You can reduce the sugar, or use the same volume amount of granulated Splenda®, or use 2 teaspoons of liquid stevia. For stevia, we’d recommend Better Stevia liquid stevia . 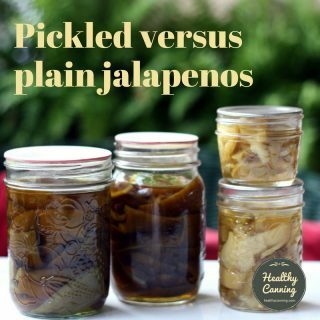 These are some flavouring options you may consider, that other mustard pickle recipes use. 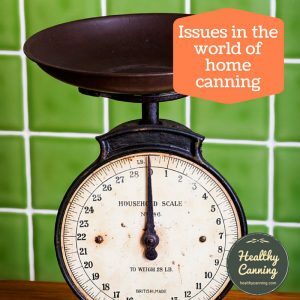 None of these will impact the pH or density of the recipe for canning safety. 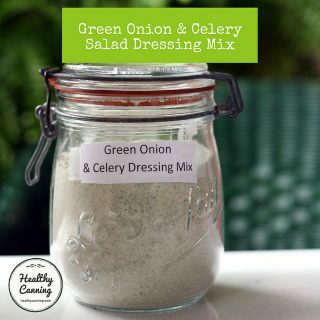 For seasoning, you could add any or all of these: 1 tablespoon celery seed, 1 tablespoon ground ginger, 1 tablespoon curry powder. Instead of the prepared mustard, you could use 3 tablespoons dry mustard powder. Instead of the 125 ml (1/2 cup / 4 oz) of water, you could use the same amount of bottled lemon juice, to brighten the flavour. 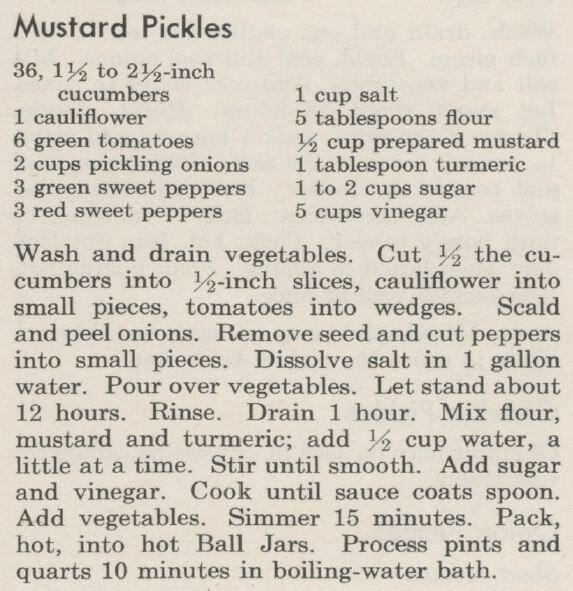 Mustard Pickles. In: Ball Blue Book. Muncie, Indiana: Healthmark LLC / Jarden Home Brands. Edition 37. 2014. Page 80. Added alternative for salt sub and liquid stevia. 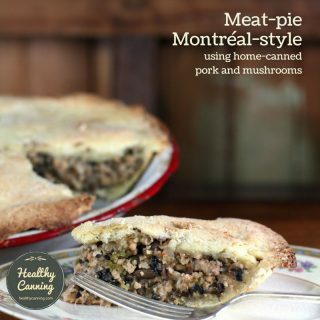 Per 2 tablespoons / 40 g.
Weight Watchers PointsPlus®: 2 tablespoons / 40 g: 0 points. 3 to 10 tablespoons: 1 point. 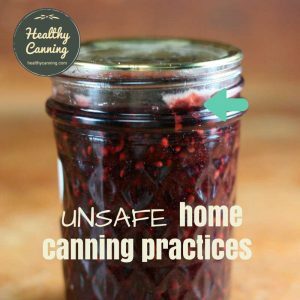 Note: always use the current recipe. Even if older versions seem similar, current versions may have been tweaked for safety reasons. 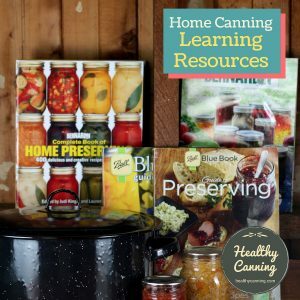 These historical versions are provided out of academic interest only to see how taste and safety requirements have evolved, and should not be used. 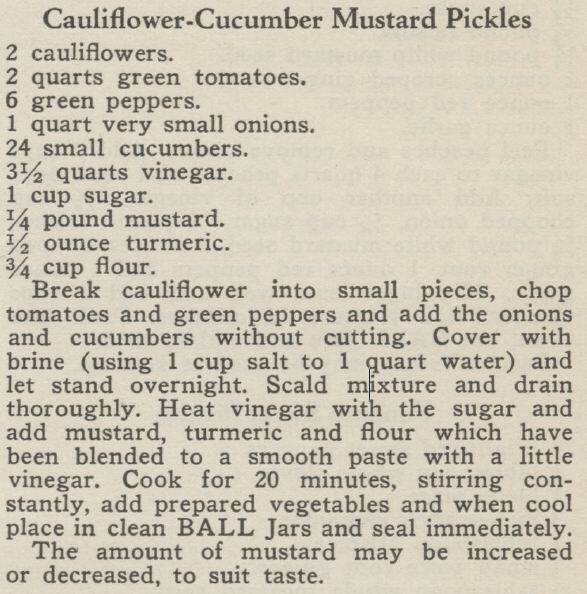 The earliest Ball version of this recipe from the 1920s, “Cauliflower Mustard Pickle”, did not have the green tomato or pepper in it. It calls for 8 cups of vinegar, 2 cups of sugar and 12 tablespoons of flour. The sauce is pure vinegar with a little water at your discretion. 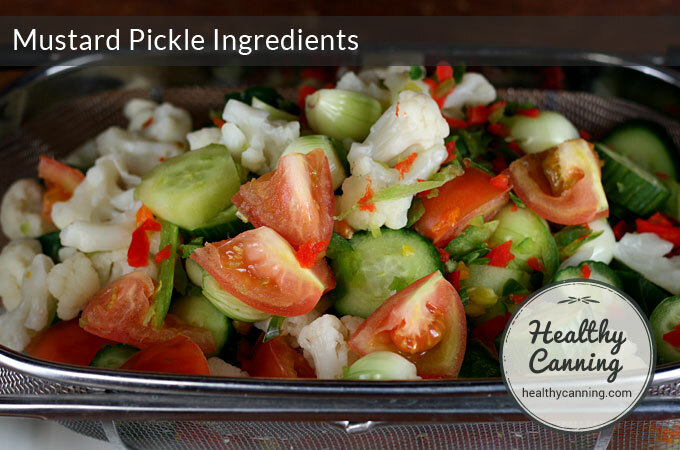 Instead of plain cucumbers, it uses dill pickles. Ball Blue Book, Edition K, (c late 1920s), page 60. Ball Blue Book, Edition K, (c late 1920s), page 60. 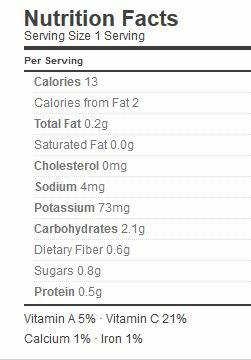 By 1930, Ball had adjusted the recipe to have the ingredient item list that it has today. It calls for 14 cups of vinegar, 1 cup of sugar, and 12 tablespoons of flour. The liquid for the sauce is pure vinegar. 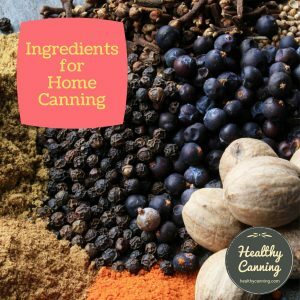 The celery seed has been dropped but the mustard and turmeric retained. Ball Blue Book, Edition O, 1930, page 42. In the 1956 Ball Blue Book (26th Edition, B, page 33), the cauliflower amount has been decreased, and the cucumber amount increased. 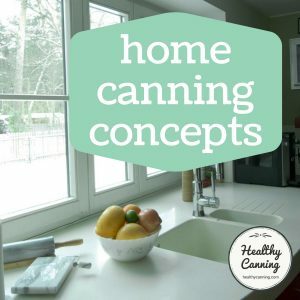 It calls for 5 cups of vinegar, 1 to 2 cups of sugar, and 5 tablespoons of flour. The liquid for the sauce is pure vinegar. 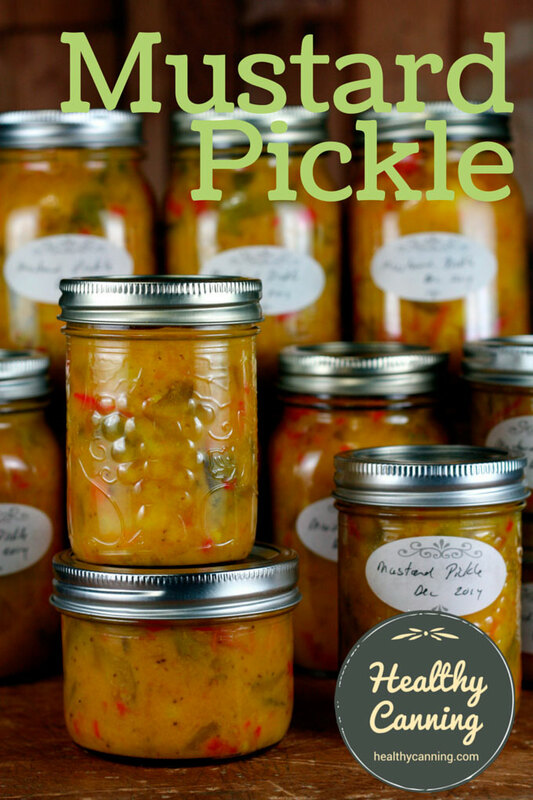 Notice the recipe is now making it clear that the jars of pickle are to be processed. Ball Blue Book 26th Edition, B reprint, 1956, page 33. In 1963, the recipe appears in the Blue Book 27th edition (page 57) in the form that it still appears as of today (37th edition, 2014). It calls for 5 cups of vinegar, 1 1/2 cups of sugar, and 4 tablespoons of flour. The liquid for the sauce is vinegar diluted with a small amount of water. Blue Book 27th edition, 1963, page 57. Every house used to always have either Colman’s or Keen’s mustard powder in it, depending on what part of the world you were in. 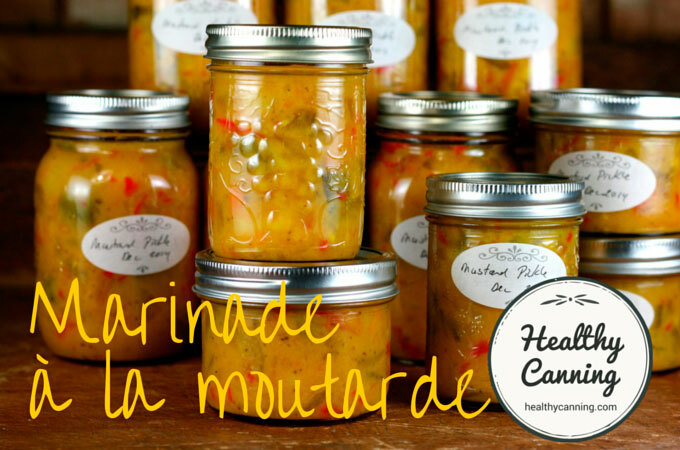 In Canada, Acadians call this “Marinade à la moutarde” and use it particularly to accompany potato dishes. 1. ↑ Ball Blue Book, Edition K, (c late 1920s), page 60.